The stress response is caused by the action of the adrenal hormones. Symptoms of adrenal insufficiency can be directly traced to a reduced secretion of these hormones when under stress. Adrenal ormones are divided into two groups, those produced in the adrenal medulla and those produced in the adrenal cortex. Genetics. 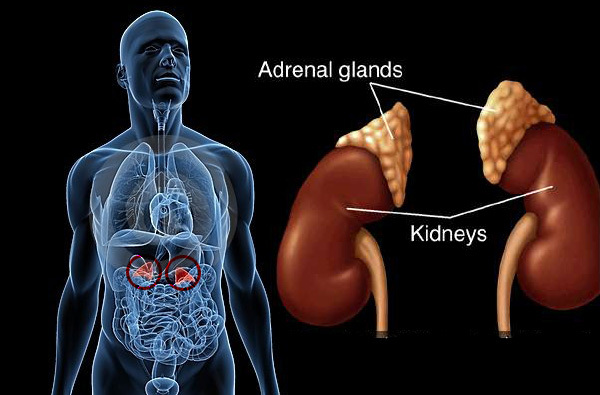 Genetics can affect the adrenal glands. Also, genetic defects can be a cause of physical and emotional stress that can weaken the adrenal glands. Congenital Weakness. Congenital means present at birth. However, it is not related to the genes. It is caused by nutritional deficiencies of the mother that are passed on to the child. It may also be caused by toxic metals or other toxins passed on from the mother's body that interfere with the functioning of the adrenal glands. This is a very common cause of adrenal insufficiency today. Nutritional Imbalances. These can begin early in childhood with inadequate diets, diet inappropriate for one's oxidation type, poor food quality, or digestive problems that prevent proper nutrition. Even natural foods today often are low in vital minerals and do not provide adequate nutrition. Pesticides, heavy metals, bacteria, solvents and other organic chemicals can all act as stressors that weaken the adrenal glands. Stimulants. Most stimulants whip the adrenal glands. This may cause one to feel better for a while, but the long-term effect is to weaken the adrenal glands. Stimulants include sugar, alcohol, caffeine, theobromine in chocolate, amphetamines and other medical drugs, cocaine, heroine and others. Other types of stimulants can include loud noise, loud music, light stimulation such as strobe lights in night clubs, excessive exercise and excessive vibration. Anger, fear and worry can actually act as stimulants as well. Note that stimulant use can be a result, as well as a cause of adrenal insufficiency. A person who is tired, due to weak adrenal glands, may be attracted to stimulants such as drugs, loud music, or anger to feel better temporarily. Infections, Energetic and Structural Imbalances. These are all internal stressors that, if left uncorrected, can eventually weaken the adrenal glands by forcing the body to mount a chronic stress response to these irritants. Toxic Substances. These may include chlorine in water, polluted air, mercury from dental fillings, household chemicals, food additives, pesticide exposure, dusts, molds and pollens. These often cause allergies that can be controlled with cortisone, the adrenal hormone. Mental Attitude. One's attitude makes a great difference in determining the stress response. Worry, fear, anger and resentment tend to increase the stress response. An attitude of gratitude, and compassion for oneself and others tends to diminish the stress response. Understanding the impermanence of the body and the world we live in, emotional detachment and detachment from all form, and a single-minded desire to extend love can greatly diminish the stress response. The only medical treatment for adrenal insufficiency is cortisone replacement therapy. Unfortunately, this therapy is accompanied by serious side effects. Calcium/potassium ratio greater than 10:1 The more of these indicators that are present, the greater the evidence of adrenal insufficiency. Also, the more extreme the values, the more suggestive of adrenal insufficiency problems. An individual in burnout has a very difficult time maintaining normal blood sugar levels. The reason is that the normal energy pathway for production of glucose from carbohydrates and fats is not operating well. Hence one desires to consume sugar directly to provide fuel for the cells. Nutritional assessment through tissue mineral analysi. Supplements to enhance overall metabolism, eliminate toxic metals and enhance absorption and digestion of food. Attitude adjustment, including letting go of resentment, blame, attachments and fears that stimulate but also can paralyze the adrenal glands. Blood sugar regulation depends upon many factors including optimal adrenal activity, the secretion of insulin and cortisone, optimal liver function, as well as adequate digestion and assimilation of carbohydrates and fats. Copyright © 1990, 1997 - Analytical Research Laboratories, Inc.